Today was a beautiful sunny day. The day started very cold with a hint of ground frost, but as the sun gathered strength it felt warmer than many of the days we have had this summer. I was beginning to despair of picking any blackberries as we don't seem to have had two dry days together, but this afternoon I managed to gather a reasonable quantity and I can see that there are many more to come, if the weather is kind to us. 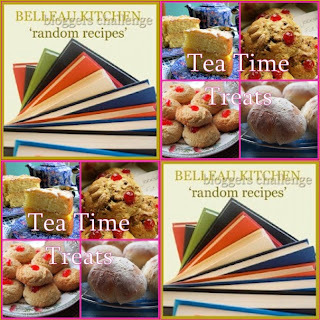 For my Random Recipe I decided to pick the two 'Little Book of Treats' that Susan, from A Little Bit of Heaven on a Plate ,sent to me. 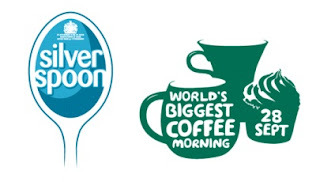 Both Susan and Karen have fabulous recipes featured in the 2012 edition of the book, which is sold at M&S Cafes in aid of Macmillan Cancer Support. 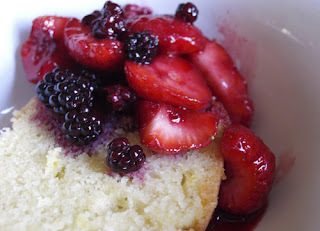 I was delighted to see that the recipe I'd chosen was for Lemon Drizzle Cake, both because it would work perfectly with the Berry Compote and also because I could try out the George Wilkinson Great British Bakeware, 1lb loaf tin. 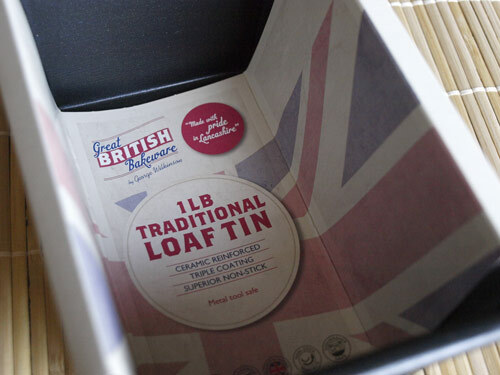 I've never had a 1lb loaf tin, always used a 2 or 3lb tin. The recipe was for a 2lb loaf tin, so I halved the quantities in the recipe, and it worked perfectly. 2. Beat the butter or margarine and sugar together until pale and fluffy. Slowly add the eggs. Sift the flour, add the lemon zest and fold gently until mixed. 3. Spoon the mixture into the tin and level the top. Bake for 35-40 minutes or until a thin skewer comes out clean after being inserted into the cake's centre. 4. Leave the cake to cool a little in it's tin. Mix the lemon juice and sugar together. Prick the warm cake all over with a fork or skewer, then pour over the drizzle. Leave in tin until completely cool. The cake baked perfectly with a nice little crack on the top. 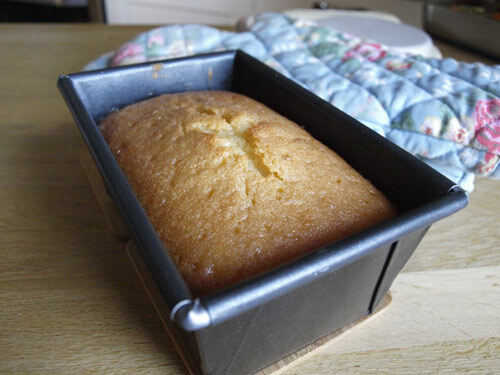 Once it had sucked up all the lemon and sugar drizzle and cooled down, I removed it from the tin. I was a bit worried that the sticky lemon drizzle would cause problems getting it out of the tin, but it came out pretty easily. I only had to ease it round the edges with a palette knife and out it came. It also sliced very well, even when still slightly warm. 1. 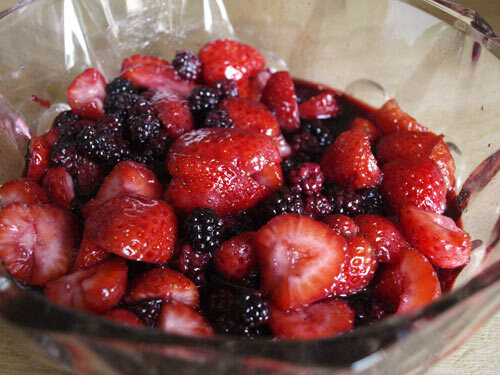 Gently heat the blackberries with the sugar and water until the juices start to run but the berries still hold their shape and colour. Remove from heat and leave to cool a little. 2. Hull the strawberries and half or quarter depending on size, place in a serving bowl. 3. Pour the blackberry compote onto the strawberries while still warm as this will draw the juices from the strawberries. 4. Cover with clingfilm and leave to cool completely. Serve the Lemon Drizzle Cake with the Berry Compote and either Greek yogurt, cream or ice cream according to your preference. Fantastic looking cake. 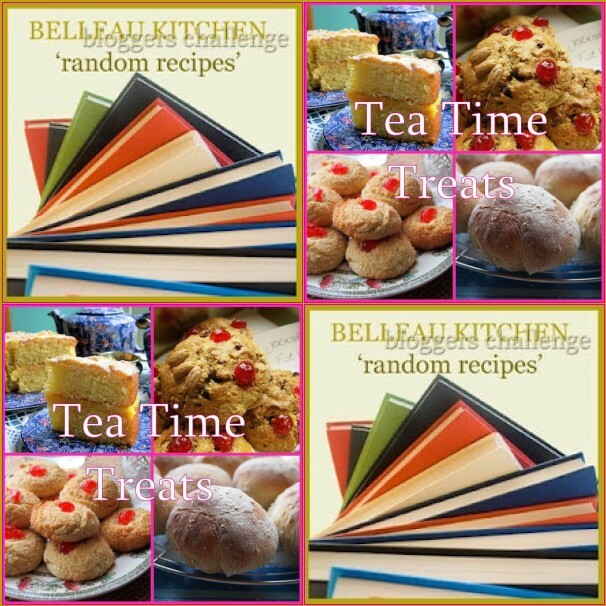 This week's Food on Friday on Carole's Chatter is about lemons and limes. It would be super if you linked this in. Have a great week. You had me from the moment I saw the berries. Together with the cake it is all so lovely ... and the some Greek yogurt ... great! It sounds gorgeous. 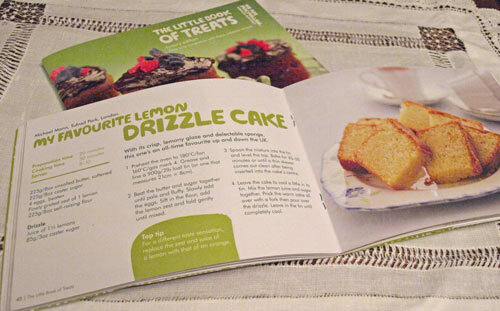 I have to make a lemon drizzle cake at some point! Thanks for all the lovely comments. It's a super little recipe, really easy and totally delicious. I'm going to try this recipe when I get home from holiday. Lemon drizzle definitely deserves its place as a classic. This looks lovely and the berry compote makes it better still. 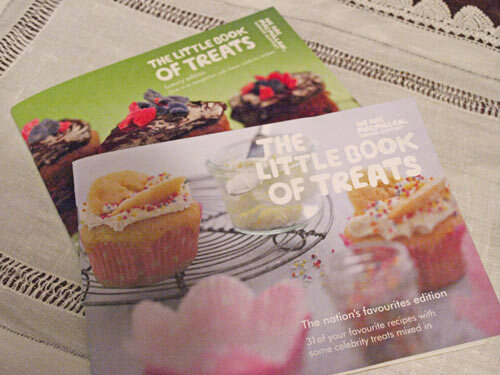 A LOVELY post Janice, and one of my favourite cakes, cannot beat a good lemon drizzle! 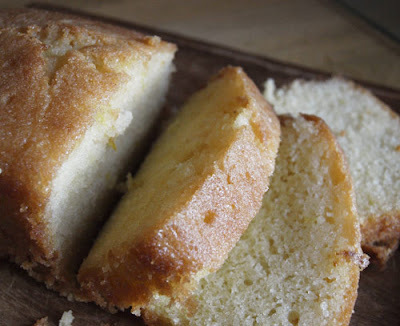 That looks like a perfect Lemon Drizzle - yum! And the berry compote makes it healthy right?!?! !